Our son's bathroom project is falling into our typical snowball trap. I prefer to blame it on our climate and location... I mean, snowballs are inevitable up here in the Midwest, right?. The original plan was just to swap a few fixtures and maybe paint the walls to take the room from a feminine guest bath to tween boy bath. 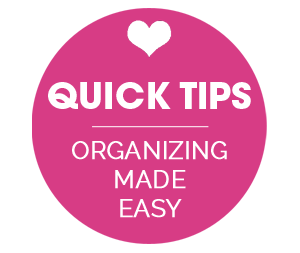 But one idea led to another and now we are making some bigger changes than we initially planned (which I totally love). 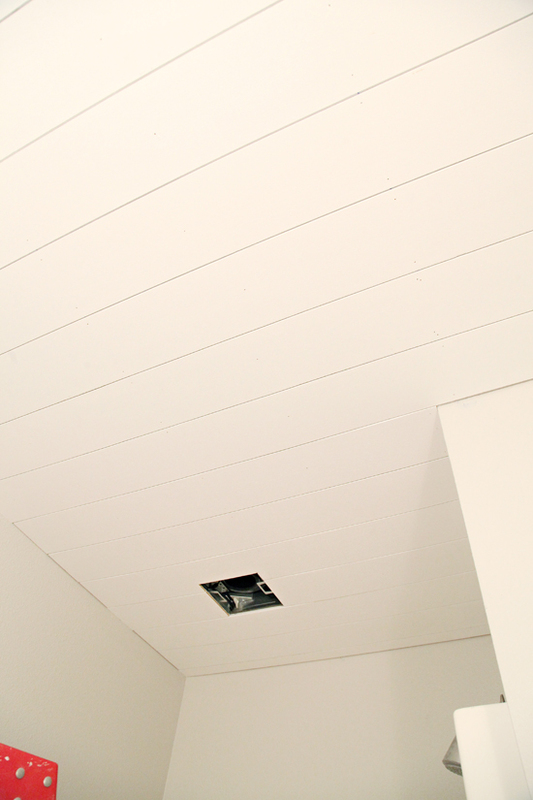 The first being a fantastic planked ceiling! 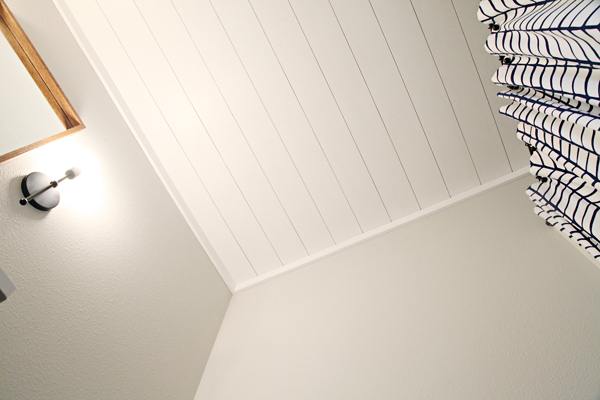 Many of our rooms have textured walls and textured ceilings. Womp womp. I am over them. Our son's bathroom is basically an 8 ft x 8 ft box with a notch for plumbing and storage. 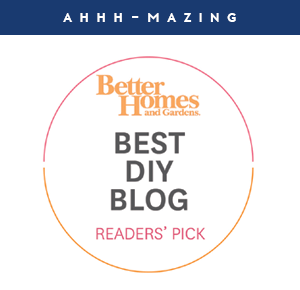 It was the ideal candidate for a ceiling treatment that would make a wow factor, be easy on the budget, and wouldn't take up multiple days and weekends that we don't have. 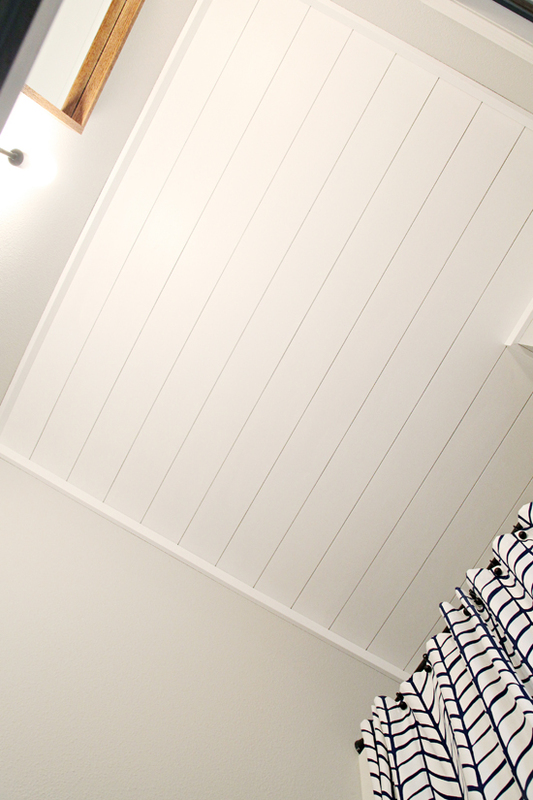 We did a small shiplap treatment in our laundry room some time ago and learned a few things from that installation that swayed us to do things a little differently here. Measure! We measured the ceiling lines and set off to our local home improvement store to source material. Consider your options. 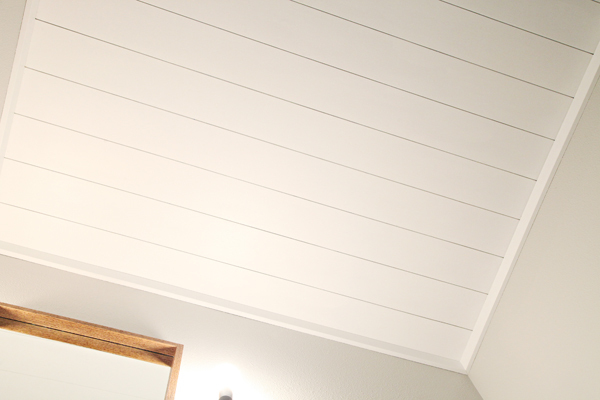 There are quite a few options when it comes to ceiling plank treatments. You can do individual tongue and groove boards, standard wood boards, or a sheet of material that you cut down on your own. We opted for the final option because of cost. We looked at individual boards in a variety of sizes and the cost was about 3-4 times as much, and the boards were also quite thick. Cutting our own brought the cost down, and also offered us the flexibility of determining the plank width. The one downside to cutting your own boards is ensuring that your lines are nice and straight over a long distance. We purchased two sheets of 4 ft x 8 ft x 1/4 in smooth plywood. Source wall moulding. I knew that capping our edges around the room would be that final touch to the project to really take it up a notch. We purchased four 1 in x 2 in x 8 ft primed trim boards. Once again, we used a thin, sanded plywood which cuts nicely and is easy to prime and paint. 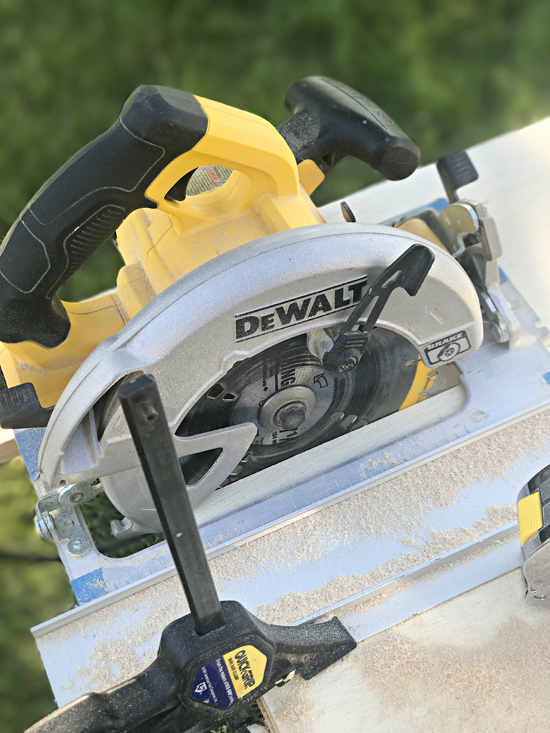 Last time we experienced a small amount of chipping, but this time we were working with a newer saw blade which we figured would help clean up the cuts. We decided we wanted our planks 6" wide which was a total of 16 planks across the ceiling. Instead of attempting to cut 16 boards exactly the same and perfectly straight, we clamped together four boards and ran the saw less. This worked out beautifully! We clamped our straight edge on each end of the boards and ran our circular saw down the entire 8 ft length with ease. The good blade ensured very little fraying occurred. We used a sanding block to sand down all of the board tops and edges prior to painting. Last time we installed the boards first and painted second. It wasn't ideal and working to keep paint out of all of the grooves was also pretty time-consuming. This time I wanted to try painting everything first and installing the boards second. We waited until there was zero rain in the forecast, and spread out all sixteen boards on saw horses and our outdoor tables. We rolled on a coat of primer, and then two coats of white paint and primer semi-gloss bathroom paint. A quality microfiber roller will help with achieving good, smooth coverage. 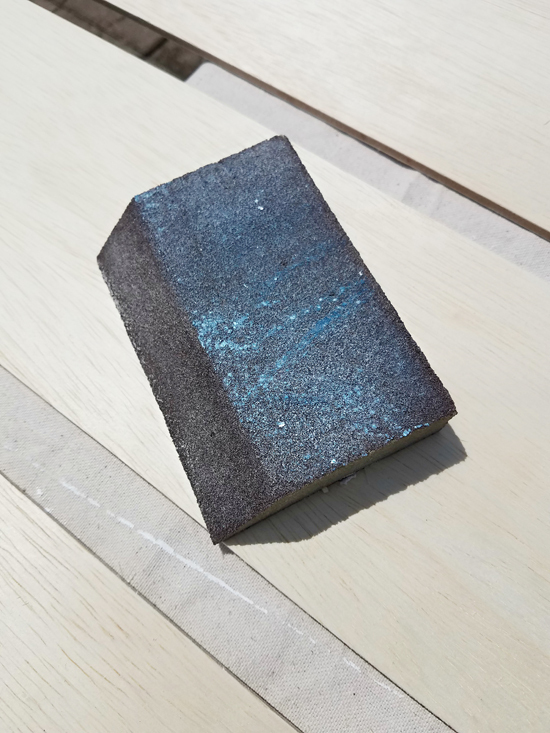 We used a brush on all of the edges for the primer to be sure everything was nice and sealed and then were able to speed up the process by using a roller on the edges for both coats of the paint. Locate and mark ceiling joists. 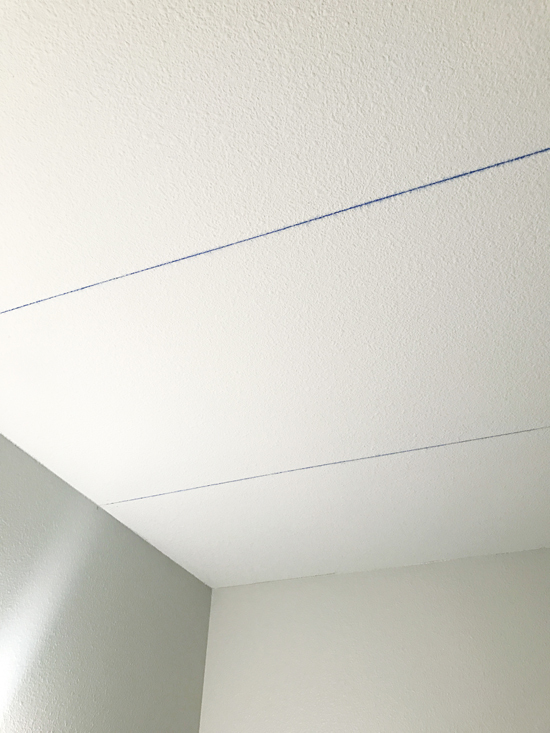 We wanted the planks to be as secure as possible so we determined the location of the ceiling joists and marked them accordingly by snapping a chalk line. We measured for each board just in case our walls weren't perfectly square. 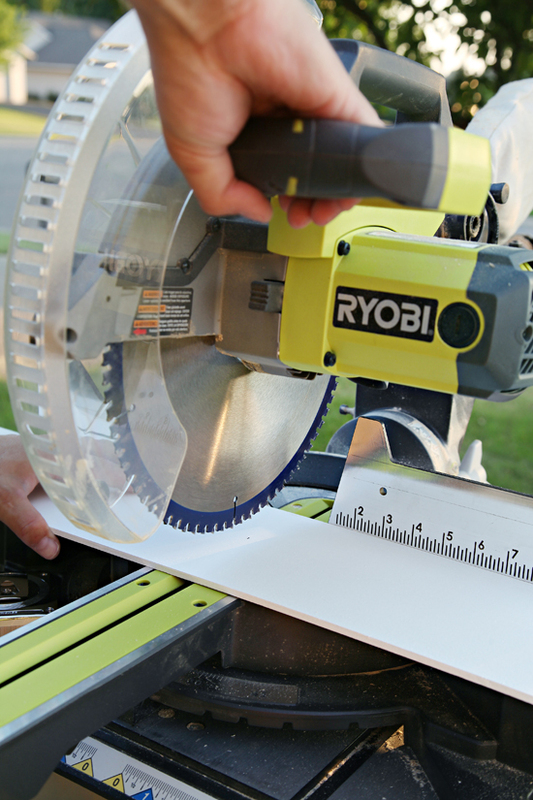 Then cut them to length with our miter saw. To be sure there was no sagging, we added a few rows of construction adhesive to the backside of the board prior to affixing it to the ceiling. We used tile spacers along the edge of the board, knocked it into place and nailed along the chalk line, as well as a few areas between. Repeat all the way across the ceiling. Measure, cut and install trim pieces. 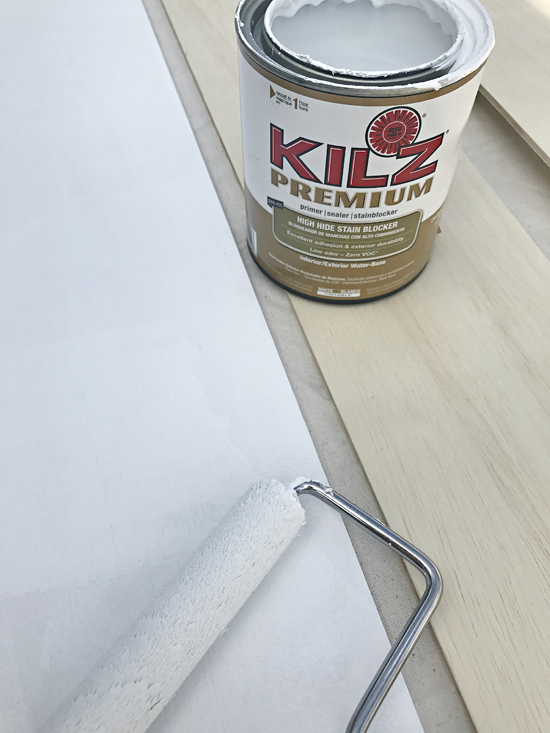 For this project, I selected a very clean trim board vs. a typical crown moulding. 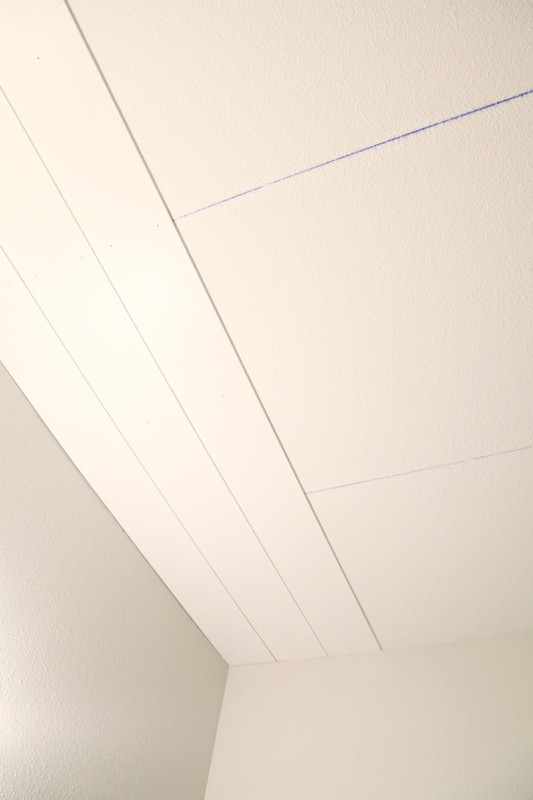 We did basic 45-degree miters around the entire perimeter of the room. Caulk and touch up paint. 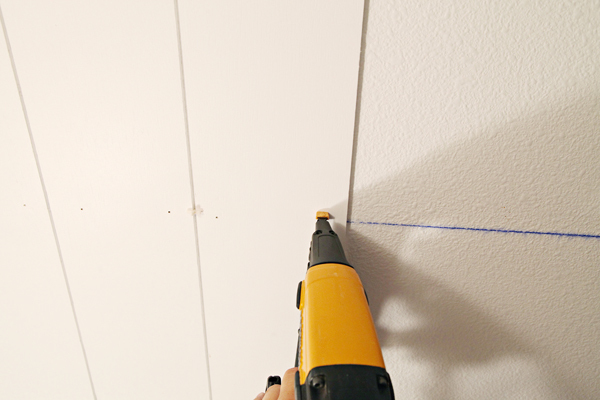 With all of the nailing and installation, the boards became dinged up in a few spots and of course, we had fresh nail holes that needed to be caulked. 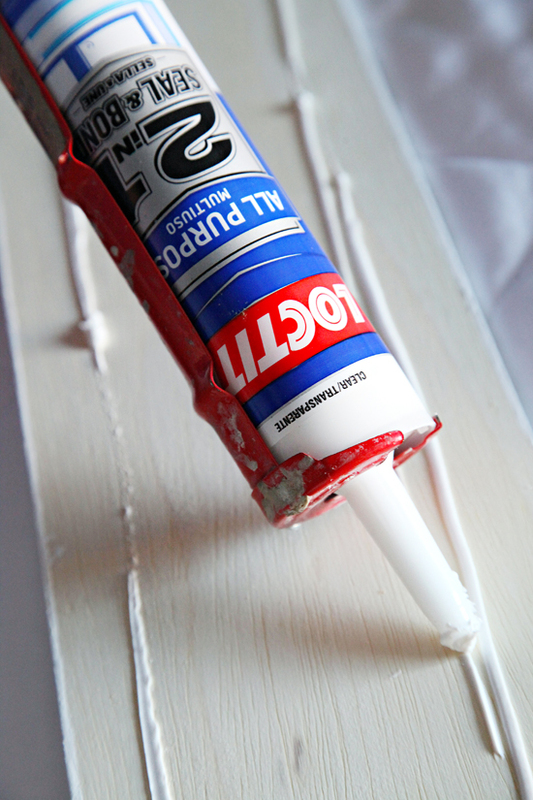 Once the caulk dried, I used a brush to touch up paint the boards. That's it! The wood cost us $54 dollars and the paint and primer quarts were another $30. We had everything else on hand to complete the project, so for under $85 we created quite the statement in this itty bitty space. This room still has a long way to go. We decided we would like to remove the fiberglass shower and install floor to ceiling tile and replace the shower fixtures. The walls have been painted Sherwin William's Nimbus and I absolutely love the warm greige color and how it pairs with the cool navy already in the space. The shower curtain is amazing and it is from here. We have also removed the old built-in cabinets on the opposite wall from the sink and have to sheetrock that in and add some floating shelves. 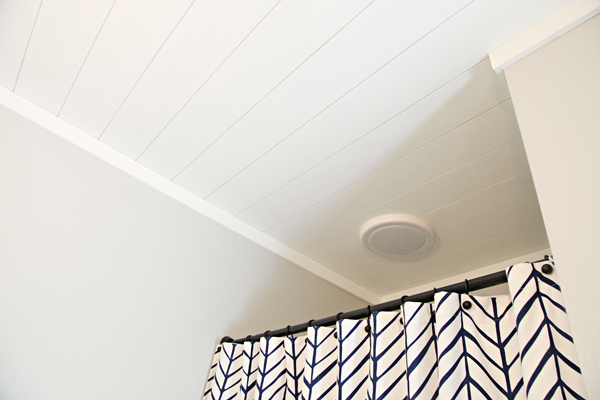 Another small upgrade we made was swapping out his previous bathroom fan with a Bluetooth version. I found a 90 CFM option at Home Depot for under $100. Our son thought the new planked ceiling was great, but this?! A fan that allows him to play his favorite music while he showers? Why didn't we do this ages ago? He loves to sing and this made showering and brushing teeth and all of those other daily "chores" so much more fun for him! 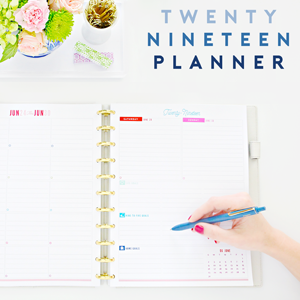 We are really excited to see how the rest of this project pulls together (especially with art and accessories). 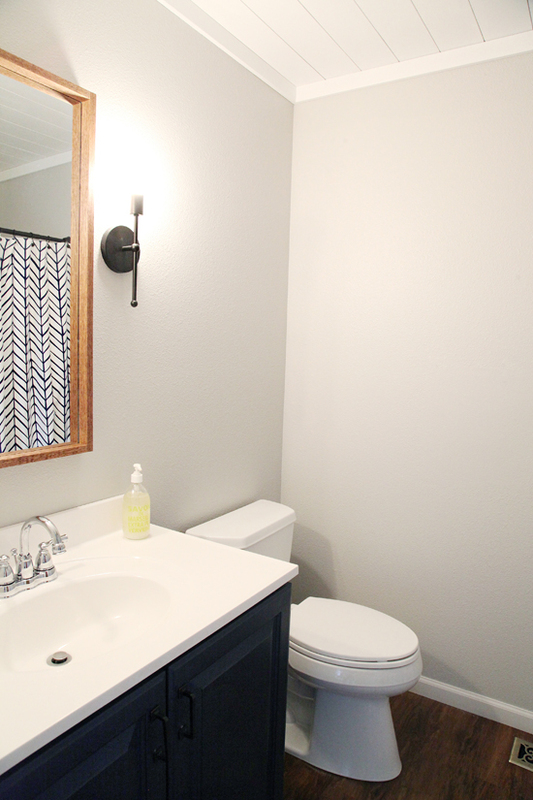 As a reader mentioned in the last update, it will be hard to top our favorite, mega-sweet guest bathroom. But we will certainly try! Check out our son's most recent bedroom update here and the DIY wood framed mirror here. Awesome Job! 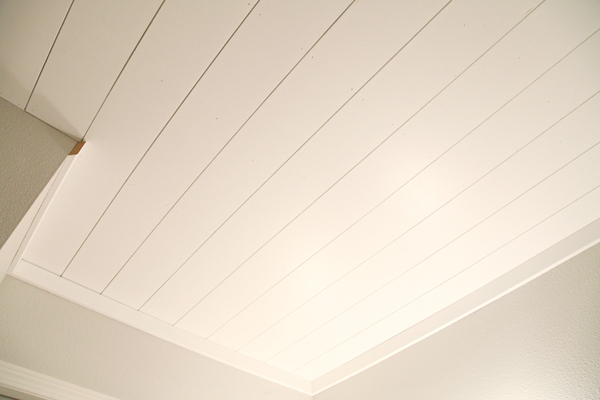 I also have popcorn ceilings and have been considering doing this in our home to cover it up. A bathroom is a great place to start. That looks fabulous!! I've been researching ways to get straighter cuts on plywood, would love to know what type of straight edge you used? Hi Kayla, I tried to track our exact model down but can't seem to find it online. 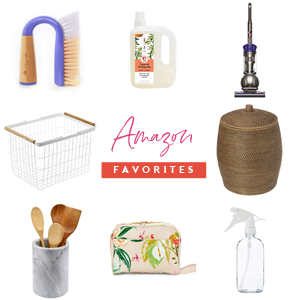 This one looks to be very similar: http://amzn.to/2vPl0ir. If you google "Aluminum cutting guide" you may be able to look at some comparable options as well. Thanks Jane! I have so many unfinished spaces going on at the moment that I have been putting off re-shooting everything. But I really do need to get it updated for you all. 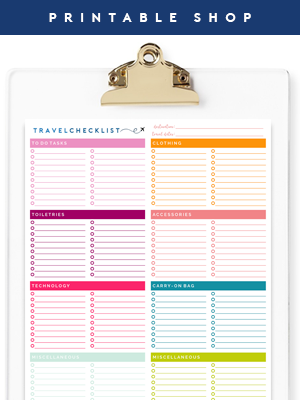 It's definitely on my goal list for the next couple of months. "He loves to sing." <3 music teacher happiness. Everything in here looks great! Can I ask what color you used for the ceiling? And for the trim? Thanks so much! I love this look, and you did a beautiful job. With the moisture from the shower, are you concerned about mold developing on the wood? We used a bathroom grade paint and also have ventilation in the bathroom and a large window in the adjoining bedroom, so we think we should be OK with any moisture in the space (we have never had signs of moisture build-up or mold in the room at all previously). 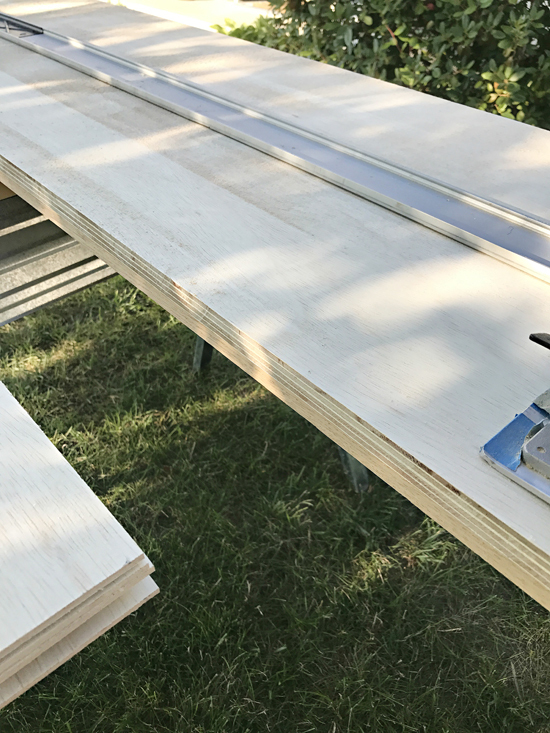 If you are at all concerned, there are other ways to get the look of planks with full sheets of grooved board or tongue and grooved pieces that would created a tighter barrier from the moisture. Do you have any concerns about moisture build-up behind the planks? I know that's what the fan is for... I would love to do this in our bathroom, but my husband is on the fence because he's concerned that moisture will collect behind the planks, causing mold. Wow! Your ceiling turned out great! What a creative way to update your bathroom!